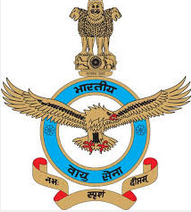 Indian Air Force (IAF) invites applications eligible Indian citizens for recruitment of following Group 'C' Civilian Posts in IAF at Headquarters Southern Air Command, Thiruvananthapuram. Eligible candidates apply within 30 days from the date of publication of this advertisement in Employment Newspaper dated 31st October 2015. Educational Qualification: Matriculation with 12th class pass or equivalent qualification from a recognized Board or University. Typing Speed of 30 words per minute in English or 25 words per Minute in Hindi on manual type writer or typing speed of 35 Words per minute in English or 30 words per minute in Hindi on Computer (35 words per minute and 30 words per Minute correspond to 10500 key depressions per hour / 9000 Key depression per hour on an average of 5 key depressions for each word. How To Apply: Eligible candidates including women can apply as per Prescribed format as under duly supported with the following documents to be forwarded to the concerned unit Commanding Officer. Eligible departmental candidates may apply through proper channel. (1) Attested photocopy of date of birth, qualification and caste certificate issued by Competent civil authority, if applicable. (2) Application duly typed with recent photograph (passport size) attested by self. (3) Self-addressed envelope with stamp of ₹ 5/- pasted. (4) Experience Certificate for the Post Cook, MTS from the employer. (5) Any other documents as required. The Last date of receipt of application is 30 days from the date of publication of this advertisement (i.e. Last date may be 30/11/2015).